Realty Income Corporation engages in the acquisition and ownership of commercial retail real estate properties in the United States. The company leases its retail properties primarily to regional and national retail chain store operators. Realty Income is widely known among its investors as the monthly dividend company. The company is a dividend achiever, which has increased its dividend for 15 years in a row by raising its monthly distributions several times per year. The company is one my best dividend stocks for 2010 list. Over the past decade the stock has delivered a total return of 18% per annum to its shareholders. Realty Income owned 2348 retail properties at the end of 2008. The company’s properties which are leased by 119 retail chains in 30 industries are located in 49 states. Most new properties acquired are under long term leases (15-20 years) with tenants from a variety of industries and geographic location. The average remaining lease life was 11.9 years in 2008. Tenants are typically responsible for monthly rent and property operating expenses including property taxes, insurance and maintenance. In addition, occupants are also responsible for future rent increases based on increases in the consumer price index, fixed increases or, to a lesser degree, additional rent calculated as a percentage of the tenants’ gross sales above a specified level. Due to the stability of company's revenue streams and above average yield, the company might be a good pick for investors who are seeking current retirement income. As a Real Estate Investment trust, the company has to distribute almost all of its net income to shareholders. 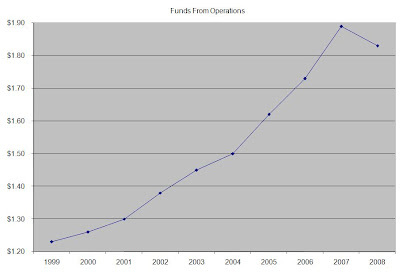 An important metric for evaluating REITs is Funds from operations (FFO), which stood at $1.83/share in 2008. Realty Income distributed $1.66 /share in 2008. FFO is defined as net income available to common stockholders, plus depreciation and amortization of real estate assets, reduced by gains on sales of investment properties and extraordinary items. The company doesn’t have any debt maturing until 2013 and also has an unused credit facility worth $355 million. Over the past decade FFO has increased by 4.5% on average. Over the past decade distributions have increased by 5.3% per annum. 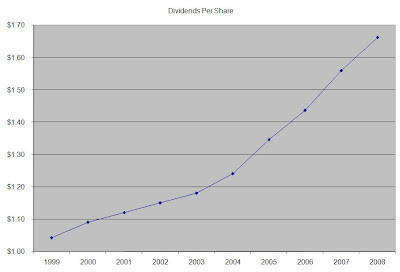 A 5% annual gowth in distributions translates into dividends doubling every 14 years. In 2009 the company has raised distributions by 1.10%. 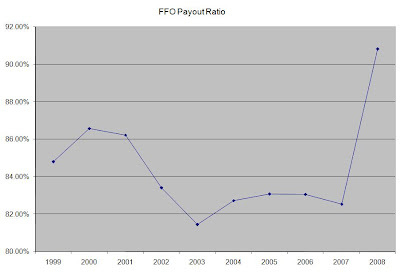 The FFO payout ratio has increased to 90.80% in 2008, which is higher than the 86.60% to 81.50% average range over the past decade. The main risk for the company is if occupancy rate decreases. About 3% - 4% of the company’s properties face lease expirations each year, which is why it has to be able to find new tenants. The company could try to sell properties which are not occupied currently however, which might be problematic in the current market for real estate. Another negative for the company is the fact that it typically expands its operations through additional sales of its common stock, which dilutes the stakes of existing stockholders. While Realty Income acquired 108 new properties in 2008, so far in 2009 it has only acquired 3 new properties. Without new acquisitions, the company might not be able to increase distributions above the rate of inflation in the future. The company owns and actively manages a diverse mix of properties, which provide a stable and dependable income stream for the company’s shareholders. Realty Income currently yields and has raised distributions and FFO’s for over 15 years in a row. I believe that Realty Income is a good addition to any dividend growth portfolio, since it provides growing income and also provides diversification into commercial real estate.